Surprise! Who guessed the fudge sauce would be drizzled over a peanut butter pie? Be honest, you had no idea. Not to mention a baked peanut butter pie! This takes everything you know about peanut butter pie and turns it on its head. Rather than a light and fluffy filling full of whipped topping and air, this is an eggy denser filling that has just the right balance of caramelized top and gooey filling. Drizzle it with some fudge sauce and get ready to be delighted. Can you believe it? Isn't it a thing of beauty? I vote you make one. Right now. Mix together the sugar, peanut butter, corn syrup and salt until well combined. Allow to cool before serving. The top will sink as it cools. Store in the refrigerator. That definitely looks yummy! 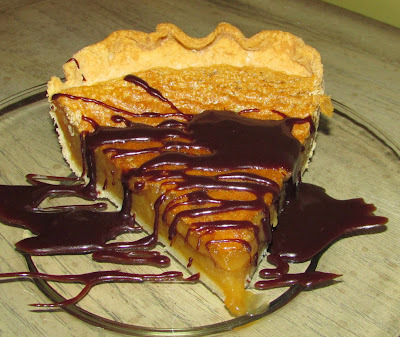 What about adding a chocolate pie crust? I'm a chocoholic. :) Thanks for sharing! I can't believe I didn't think of that! That is an excellent idea! You know how to make my mouth water Carlee! This looks amazing! I love peanut butter anything. Thanks for sharing at What'd You Do This Weekend? I hope you will join us again this Monday morning! I love peanut butter too! Thanks for hosting, have a great weekend! Oh My! This looks absolutely amazing. Thank you for sharing on Sunday's Best. Yum! It was! Thanks for hosting! It was so good! Thanks for stopping by! I know! It is so tempting to make another one... but there are so many other things to make and post! Sure wish I had a slice of this awesome pie right now! Happy St. Patrick's Day and thanks so much for sharing with Full Plate Thursday! Oh my goodness, me too! Happy St. Pat's to you as well! Yum this looks so great! Pinning and sharing. Thanks for sharing at Totally Terrific Tuesday last week! I can't wait to see what you have lined up for this week. It was really good! Thanks for stopping by, see you Tuesday! This pie looks so tempting! it's featured this week on Funtastic Friday. Hope you can join us again this week. Thank you!! That is so much fun! Yum Yum Yum! What else needs to be said. I think this is the same recipe I had years ago but lost some where in the many moves we made. I remember it was made similar to a pecan pie. I loved it some much I burned my mouth cause I couldn't wait for it to cool. Can't wait to try it. Thanks so much for sharing!! I hope this does your memories justice! I love the texture and peanut butter and I are old friends. Thanks for stopping by!